UPDATE: Burger King has fired three employees over the incident. PREVIOUSLY: The tech media likes to describe Internet image board 4chan as a lawless, unruly place, but apparently there's justice in the Web's Wild West after all. An anonymous 4chan user and Burger King employee posted a photo of himself stepping in bins of lettuce to the site on the evening of July 16. The original poster captioned the image with "This is the lettuce you eat at Burger King." But some 4chan users were appalled by the image and decided to take action. They grabbed the GPS data included in the picture in an effort to pinpoint where the photograph had been taken, the Cleveland Scene reports. In addition to contacting local news media in Mayfield Heights, Ohio, where the image originated, users also managed to pull up the address and telephone number of the exact Burger King location where the event allegedly took place. E-mails and phone calls quickly followed. And according to Hypervocal, it only took 4Chan users about 15 minutes to expose the alleged perpetrator. 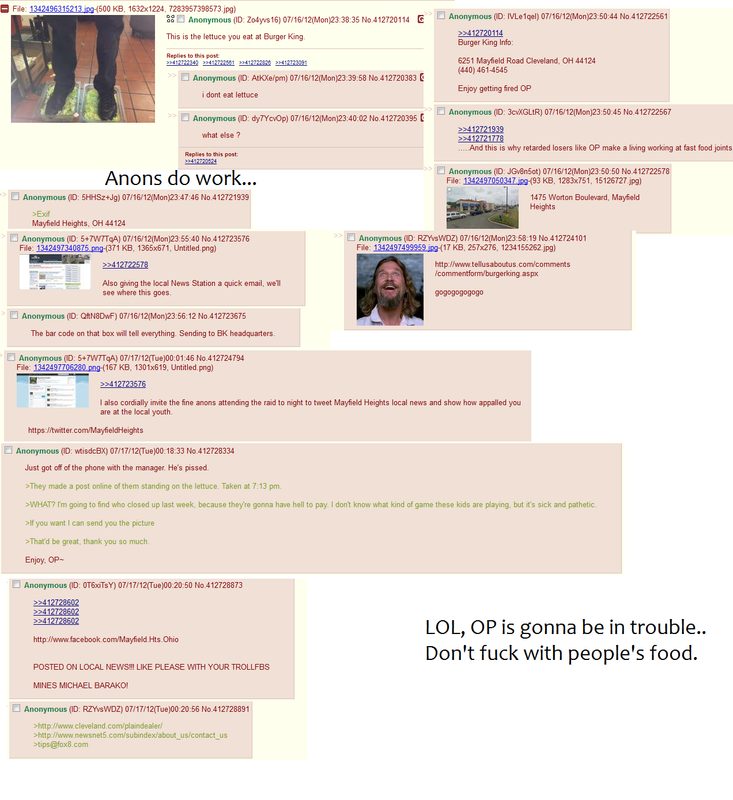 A montage of the 4chan users' responses was posted to Reddit on Tuesday. The Huffington Post contacted a manager at the Mayfield Heights Burger King, who said that the alleged perpetrator was a long-time employee. Though the manager refused to disclose other details, she stated this was the employee's first disciplinary incident in his employment history. The Cleveland Scene spoke with a shift manager about the incident, who said that both the employee and the shift manager on duty at the time of the incident would be fired.